I owe some very interesting discoveries to Sula Bassana! Apart from his latest solo albums, the one who runs the Sulatron label's guides introduced me to Son of Ohm and now to Sun Dial. Led by Gary Ramon, this English band has become over the years an icon in the genre of psychedelic rock. Except that since 2016, with the album Made in The Machine, Gary Ramon and his new journeyman Scorpio take on a particular challenge by adding a touch of electronic to a psychedelic music, transcending the borders of Krautrock, of psybient and of psybeat with a tasty approach of Space Rock totally crazy. “Science Fiction; A Compendium of Space Soundtrax” is a collection of 12 short titles whose cinematographic approach is quite obvious with an average time of 3:33 per title, excluding the bonus track. 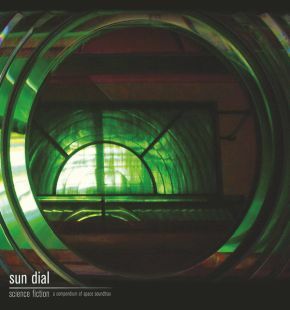 Sun Dial disguises its titles with a splendid sonic canvas where the terror is not too far from the cosmic and where the cosmos is really rooted in a seductive 1970's tone. And it takes off with "Hangar 13" and its musical envelope that makes me think strangely of Tomorrow Never Knows from the Beatles. The pace is slow. Pummeled by good and heavy percussions and chewed up by a bass line and its organic language, "Hangar 13" is fed by a Hindu ambience with Sitar tones and with nice synth melodies. The ambiences are bursting with electronic sounds which flirt with the world of video games and with the boundaries of psychedelic music with twisted filaments and reverb effects. These elements adorn most of the titles of an album which literally surfs over several genres and more than one era. Percussion plays a decisive role as the guitars in “Science Fiction”. They propel the lustful rhythm of "White Stone" and its Ray Manzarek organ tones. Guitar solos as cosmic as horrific swirl on this title which literally does Flower Power. "Mind Machine" follows with an aggressive Spacy Funk which survives very well in this sonic fauna where the line between psychedelia and the extraterrestrial vision of the 70's has never been so fusional. Fascinating again here, the bass line chewed our ears a long time after its last gurgling. "Saturn Return" reminds me of old good Bebop Deluxe. Its rhythm is slow and hosts merged harmonies between an organ and a synth. Even while being sober, percussion and bass do the job while the sound effects of the cosmos remind us the meaning of the title. Short but effective! I just love "Space Travel"! Its slow and magnetizing rhythm, where a fascinating melodic approach sits, is simply kiss-curl. A beautiful cosmic slow which rings the time of the sweetnesses of this album since "Alien X" follows with a structure slightly more lively built around orchestrations which sound out of tune in this strange spacey setting. The guitar riffs which weave 60's harmonies loops also stand out against the misty orchestrations of the Mellotron. We listen to "Rise of The Robots" and we say to oneself that indeed the music sticks to the title. The rhythm is catchy with a simplistic vision which sticks to the imagination of the creators of the time. It flows by the jolts of the drums and the bass, while the harmonies are woven into chords of which the echo effects adopt the robotic rhythm. "Airlock" clings a bit to the settings of "Hangar 13", but with a more Doors vision, even with the presence of the Sitar. "Aftershock" also offers a thing near the beat in "Hangar 13". Except that here, the envelope of the rhythm and of the moods is more in the 80's, in the synth wave era. "Ghost Ship" is elusive! A dark music, ideal for the horror movies of the silent years, with effects of reverberations which roll in loops in order to spread a tissue of percussions, organic riffs and psychedelic effects on a structure more fluid than jerky. We leave the universe of psychedelic cosmic rock a little on this title which remains quite mysterious when an intensity in the ambiances adds a bit of paranoia. "Infra Red" is a title which is very Beck, while "Starwatchers" concludes with the most cinematographic approach, especially at the level of the arrangements, of “Science Fiction; A Compendium of Space Soundtrax”. This fascinating compilation is offered with an extended version of "Hangar 13", as a bonus track. The music transits between the original opening towards a more ambient, more acoustic finale. Both versions are very good and are also the unsuspected engine of an album that will seduce more than one with its sweet madness of the psychedelic years. In the end, Sun Dial offers here an astonishing range of psychedelic cosmic rock with just what it needs to appeal to a wider audience. Very great! Je dois de très intéressantes découvertes à Sula Bassana! Mise à part ses derniers albums solos, celui qui tient les guides du label Sulatron m'a fait découvrir Son of Ohm et maintenant Sun Dial. Mené par Gary Ramon, ce groupe Anglais est devenu au fil des ans une icône dans le genre rock psychédélique. Sauf que depuis 2016, soit avec l'album Made in The Machine, Gary Ramon et son nouvel acolyte Scorpio relève un défi assez particulier en ajoutant un soupçon d'électronique à une musique toujours psychédélique, transcendant les frontières du Krautrock, du psybient et du psybeat avec une savoureuse approche de Space Rock totalement déjanté. “Science Fiction; A Compendium of Space Soundtrax” est une collection de 12 courts titres dont l'approche cinématographique est assez évidente avec un temps moyen de 3:33 par titre, excluant la pièce en bonus. Sun Dial maquille ses titres d'une splendide toile sonique où l'épouvante n'est pas trop loin du cosmique et où le cosmos est véritablement enraciné dans une séduisante tonalité des années 70.Et ça décolle avec "Hangar 13" et son enveloppe musicale qui me fait étrangement penser à Tomorrow Never Knows des Beatles. Le rythme est lent. Matraqué par de bonnes et lourdes percussions et mâchouillé par une ligne de basse et son langage organique, "Hangar 13" est nourri par une ambiance Hindoue avec des tonalités de Sitar et par des belles mélodies synthétisées. Les ambiances sont gorgées de ces bruits électroniques qui flirtent avec le monde des jeux vidéo et les frontières de la musique psychédélique avec des filaments torsadés et des effets de réverbérations. Ces éléments ornent la plupart des titres d'un album qui surfe littéralement sur plusieurs genres et plus d'une époque. Les percussions jouent un rôle aussi déterminant que les guitares dans “Science Fiction”. Elles propulsent le rythme lascif de "White Stone" et de son orgue à la Ray Manzarek. Des solos de guitare aussi cosmiques que d'épouvantes tourbillonnent sur ce titre qui fait littéralement Flower Power. "Mind Machine" suit avec un Funk cosmique agressif qui survit très bien dans cette faune sonique où la ligne entre le psychédélisme et la vison extra-terrestre des années 70 n'a jamais été autant fusionnelle. Fascinante encore ici, la ligne de basse nous mâchonne les oreilles bien longtemps après ses derniers borborygmes. "Saturn Return" me fait penser à du bon Bebop Deluxe. Son rythme est lent et accueille des harmonies fusionnées entre un orgue et un synthé. Même en étant sobres, les percussions et la basse font le travail alors que les effets sonores du cosmos nous rappellent le sens du titre. Court mais efficace!